The WMFC parking lot was a bustle of activity in late September. All afternoon people lined up to get a place in line for the fall food giveaway. Some came as early as 1:30AM and one family even pitched a tent on the grounds and stayed overnight to insure their place in line. Approximately 60 volunteers from the community, West Midland Family Center, the Emergency Food Pantry Network and the First United Methodist Church were on hand to help serve the 741 individuals that came for help. Hundreds of pounds of food purchased by a local church and distributed by the Food Bank of Eastern Michigan was handed out to those waiting in line. 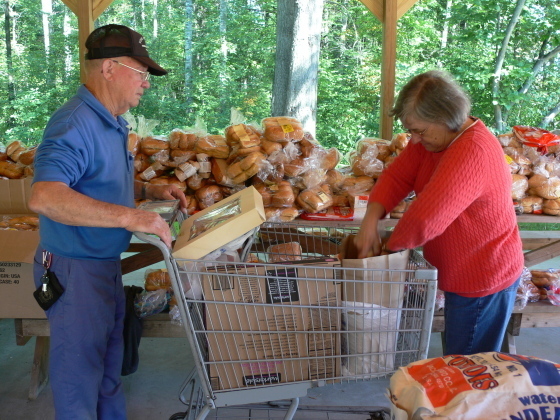 The September food giveaway was just one of several that occur throughout the summer months. “Food giveaways occur every month through the summer at different sites,’explained WMFC Food Giveaway Coordinator Diane DeMott. WMFC is the site for the September giveaway. WMFC has been a long time sponsor of the event. Each year hundreds of people are helped.